The Friendly City Food Co-op is an organic market in Harrisonburg. Download the DEALS here before you shop our organic market! 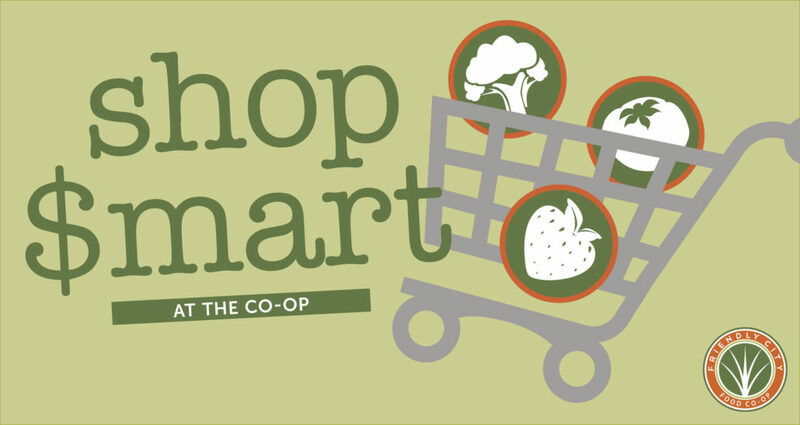 You can also find printed flyers in the grocery store cashier areas so you can take advantage of all the awesome savings the Co-op has to offer. There are many ways to save money at the Co-op. Here are just a few. There are store savings flyers and coupon books for Shop $mart and Co-op Deals located at the entrance to the grocery store and the checkout area. Owners may also download the Owner Extra Coupon. Not an owner yet? Find out how! Another way to save money at the co-op is to look for our grocery store value line of Co+op Basics. For example, our Field Day products include everything from cereals and paper towels to salad dressings and cookies, and they all offer a healthy discount. Buy from our Bulk foods section. Not only do you buy only what you need, but you don’t pay extra for packaging. At Friendly City Food Co-op, you have the opportunity to discover food and products that are better for you and better for the world. In an effort to provide more competitive pricing for our customers, Friendly City Food Co-op is happy to accept coupons. Mix and Match– when you buy six bottles of any wine, beer and/or hard cider (500 ml / 17 oz or more), you’ll get 10% of the total amount. If you are a co-op owner, you are eligible to participate in Owner Rewards– our new rewards program. 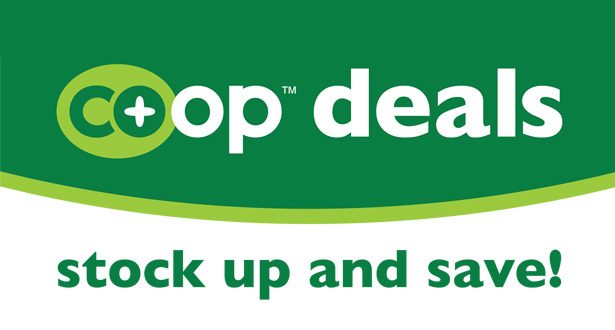 You automatically earn points every time you shop at the co-op, which can be used as cash toward future purchases. In addition to rewards points, there are bonus rewards offered throughout the year. Read more about it here. Friendly City Food Co-op reserves the right to refuse any coupon for any reason. 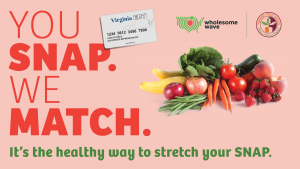 Thanks to a grant from Virginia Fresh Match, we are now able to offer a SNAP match to our customers who use SNAP/EBT. The co-op will essentially pay for 50% of your produce purchase, up to $10. That means if you purchase $10 worth of fresh fruits and vegetables, you will get $20 worth of produce. Friendly City Food Co-op is one of only two grocery stores in the state currently offering this program. Go Local! Visit Our Organic Market Today.